Save the Dunes and partners across the Calumet region have been using conservation planning as a tool to enhance natural resource protection and restoration efforts in high-quality natural areas. Most recently, the Calumet Collaborative helped organize a partnership between Save the Dunes, The Nature Conservancy, Northwestern Indiana Regional Planning Commission, Field Museum, Shirley Heinze Land Trust, and other regional partners in conservation and land management to create plans for Oak Ridge/Hoosier Prairie in Lake County, Moraine/Sunset Hill in Porter County, and Ambler Flatwoods in LaPorte Count, funded by the Indiana Department of Natural Resources Lake Michigan Coastal Program and the National Oceanic and Atmospheric Administration. We often refer to the conservation planning process as CAP - Conservation Action Planning. The CAP process is a step-by-step planning tool developed by the Nature Conservancy and can be implemented using a workbook and set of online tools. While conservation planning efforts across Northwest Indiana have used the CAP process as guidance, these projects has been less formal and technical. Conservation planning involves identifying conservation priorities in a set geography, such as prairies, marshes, or savannas; threats to those priorities, such as invasive species, increased development, and pollution; and strategies to protect them. These strategies can be incorporated into annual work plans for land protection agencies and organizations and can help guide land acquisition and restoration projects. In Northwest Indiana, our natural areas are fragmented. Conservation planning encourages protecting the system as a whole, relying on partnerships, cooperative management, and consistent restoration and management goals across a landscape. 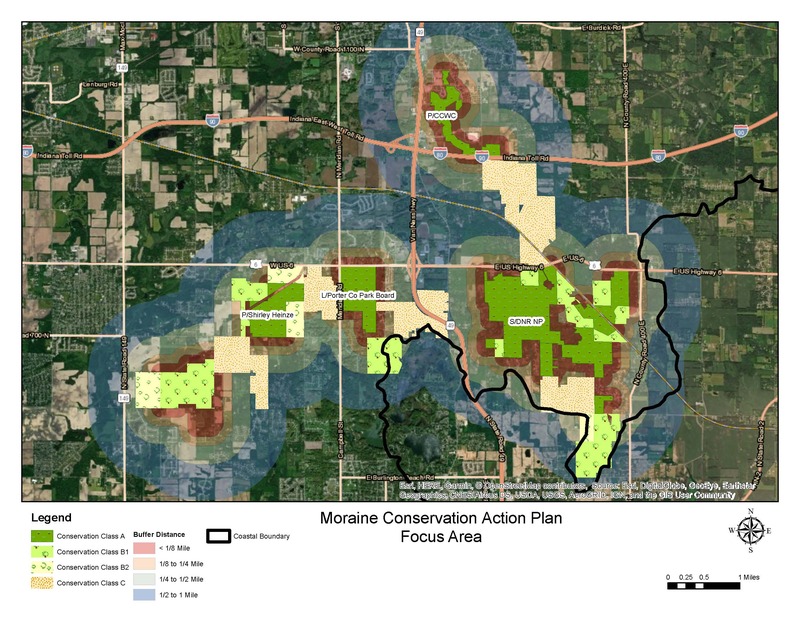 In the above example of Moraine Nature Preserve/Sunset Hill, partners from the Department of Natural Resources, Shirley Heinze Land Trust, and Porter County have used the conservation planning process to set goals and priorities across jurisdictional boundaries and identify areas for acquisition, restoration, or policy needs. Conservation plans maximize the limited funding available to land managers by syncing projects and enhancing protection efforts. While conservation planning is often guided by land managers and regional ecologists, the strategies developed through the process are often impacted by surrounding landowners. In many instances, the conservation plan can be used by the public to inspire green infrastructure projects, individual stewardship projects such as invasive species removal or native species plantings, sustainable development and other best management practices, and a local conservation ethic. We look forward to sharing these plans with local communities and looking for opportunities to work together to protect the Indiana dunes and other treasured natural resources of Northwest Indiana. Keep an eye out for upcoming events highlighting these opportunities!